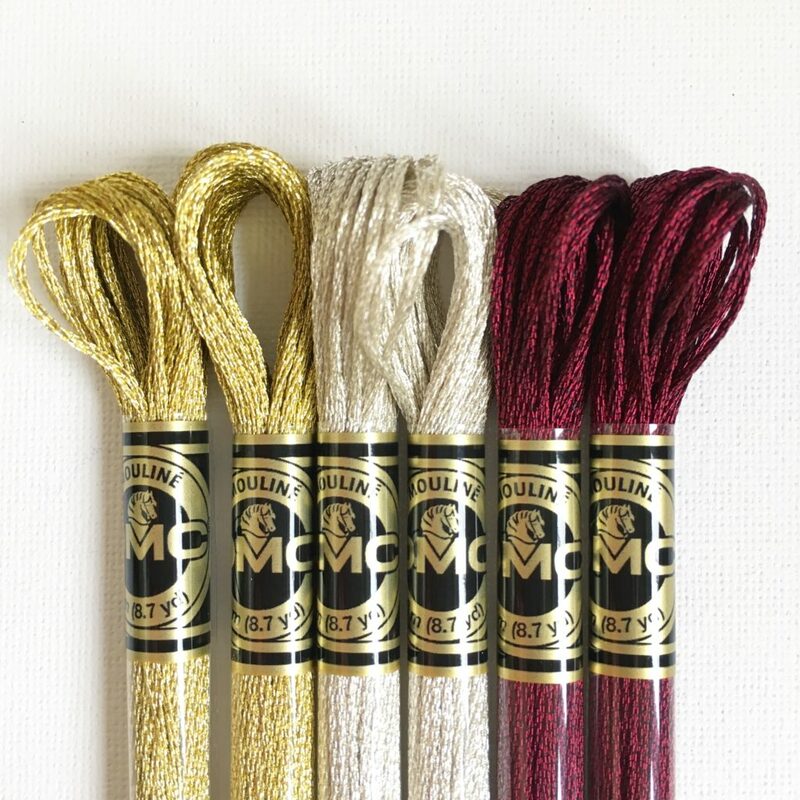 In this post, I’m going to compare 2 of my favourite collections of thread; DMC Light Effects and Étoile. 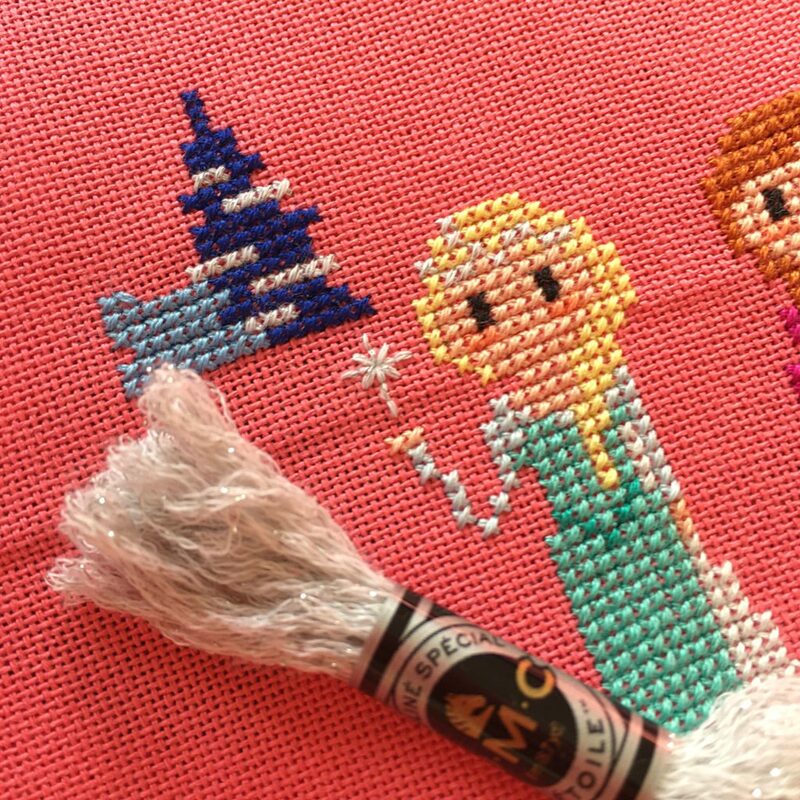 Light Effects is a metallic thread and Étoile is a glitter one. Is Light Effects or Étoile thread easier to stitch with? Which has the better range of colours? Is Light Effects or Étoile more sparkly? 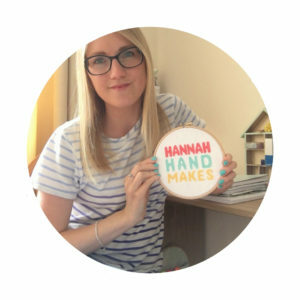 I answer all these questions in the post as well as sharing my favourite of the 2! *This post contains affiliate links that if you click I may receive a small commission on. But I only ever recommend things I have tried myself. No time to read this post now? Scroll to the bottom to pin for later! When DMC released their Étoile threads at the end of 2018 I felt the excitement radiating out of my phone. These new glitter threads where all over my Instagram feed. There was just 1 problem though – everyone was using a filter over them to exaggerate the glitter. I do understand why – taking a photo of subtle glitter is tough. But no one was quite sure just how much sparkle these threads had. I knew I had to get my hands on some so bought it quickly from Sew and So and made a couple of Christmas kits with it. Then there’s Light Effects thread. This thread has been around a while but has a bit of a bad rep in the stitching world. Some people (myself included) love stitching with it, but we are a rare breed. Most people avoid it altogether. And then there are those that really want to like it but most of the time they want to throw it out of the window (I have a blog post all about how to avoid that feeling). Which camp do you fall into? So let’s compare the 2! Is Light Effects or Étoile thread easier to stitch with? This is an easy one to answer; Étoile is much easier to stitch with than Light Effects because it is softer and cotton based. It is 70% cotton and Light Effects thread is 100% polyester. However, it’s not completely throw-it-out-of-the-window free. It gets more tangled than ordinary cotton does and knots more easily too. It is also more prone to fraying at the ends, similar to Light Effects, but not quite as bad. However, just like Light Effects, a bit of thread conditioner can help rectify this problem. (I use Milward beeswax or Thread Heaven*). If ease of stitching is something that is important to you then Étoile should be your choice, but expect to put just a little extra work and love into this thread. Which has the better range of colours? 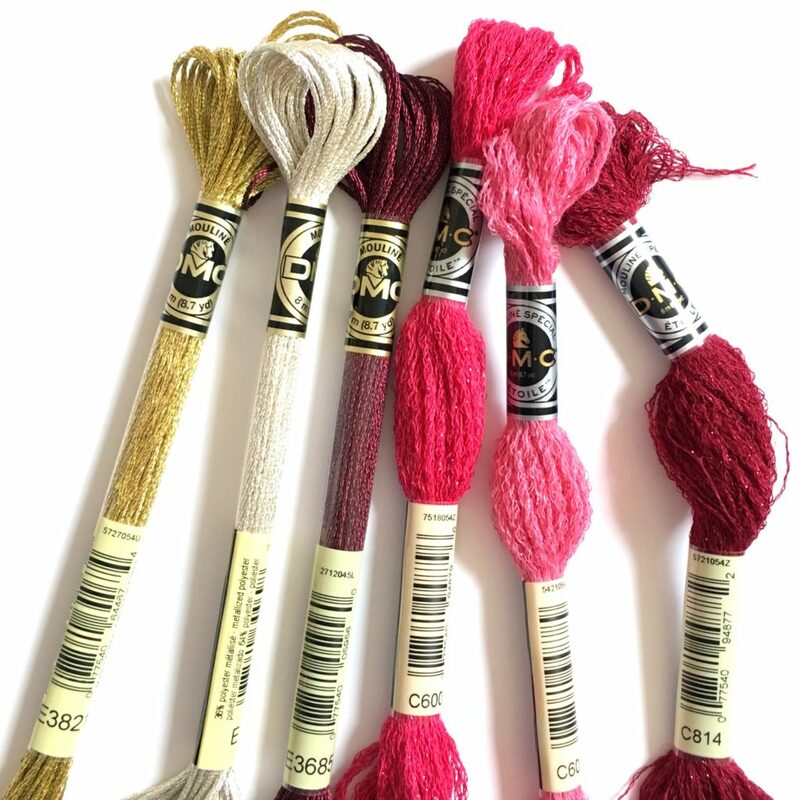 Just like Light Effects, each Étoile thread has a cotton pair. For Light Effects thread the number will start with an “E” and for Étoile it will start with a “C”. For example, one cotton red colour is 321. Its Light Effects pair is E 321 and its Étoile pair is C 321. There are 35 colours for the Étoile thread and 33 colours for the metallic Light Effects (there’s also neon and glow in the dark). They both have a similar number of colours available and it will probably just be luck whether the colour you want has a Light Effects or Étoile pair. One thing I did find is that it’s usually one or the other, not both like the red example I gave above. One of my favourite colours is DMC 814 and this is available in Étoile, but not Light Effects. If you are looking for gold or silver or those other metal colours then I recommend Light Effects as their gold and silver are more true to actual gold and silver and it is usually these colours that I use in my designs. Is Light Effects or Étoile more sparkly? Étoile thread has more of a subtle sparkle compared to Light Effects, but it still has a nice finish. 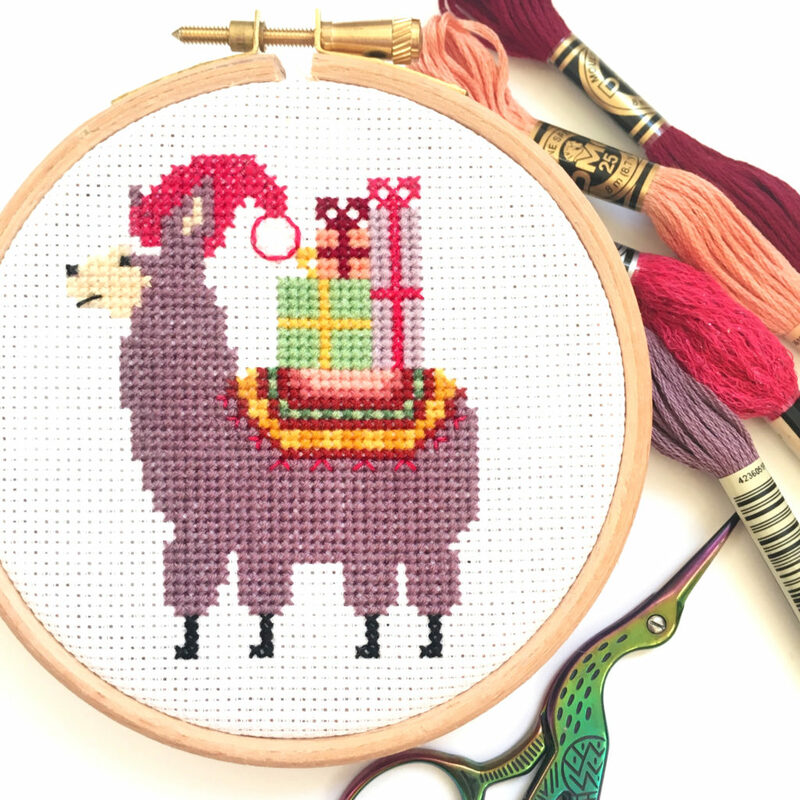 The Llama hat is stitched in Étoile threads – see, subtle! I use it in many designs and love it, but you should know that it isn’t as sparkly as you probably think it is due to the use of that filter. Don’t let that put you off though! Subtle sparkle is still sparkle! You just might need a larger area of stitches to get the full affect. Light Effects has more of that glitter in it and will shimmer and shine in all of your designs, no matter how small they are. If extra sparkle is what you are looking for then choose Light Effects. Étoile is a great solution if you get frustrated stitching with Light Effects (this is probably the reason DMC released Étoile), but I don’t think you have to choose one or the other. I use both. In fact, I used both in the same design (the reindeer below) and they worked pretty well together. 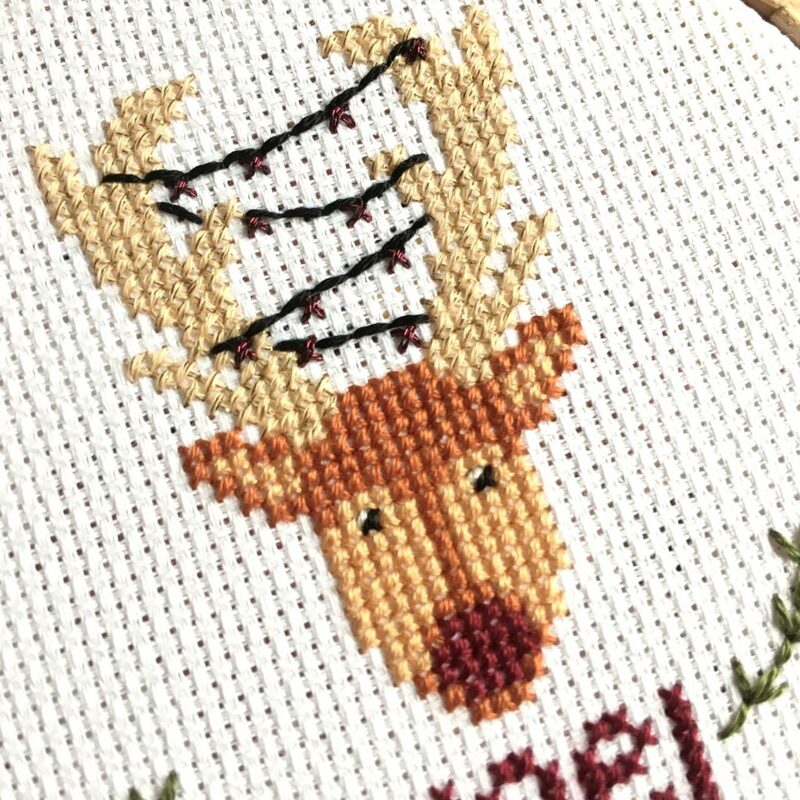 If you would like to try using both you can buy this reindeer kit for yourself! I have a general rule though which is so easy it’s probably a bit laughable. For anything that is meant to be metal, I tend to fo for Light Effects and I use it for stars too. For anything else I want to add a little glitter to, I use Étoile. 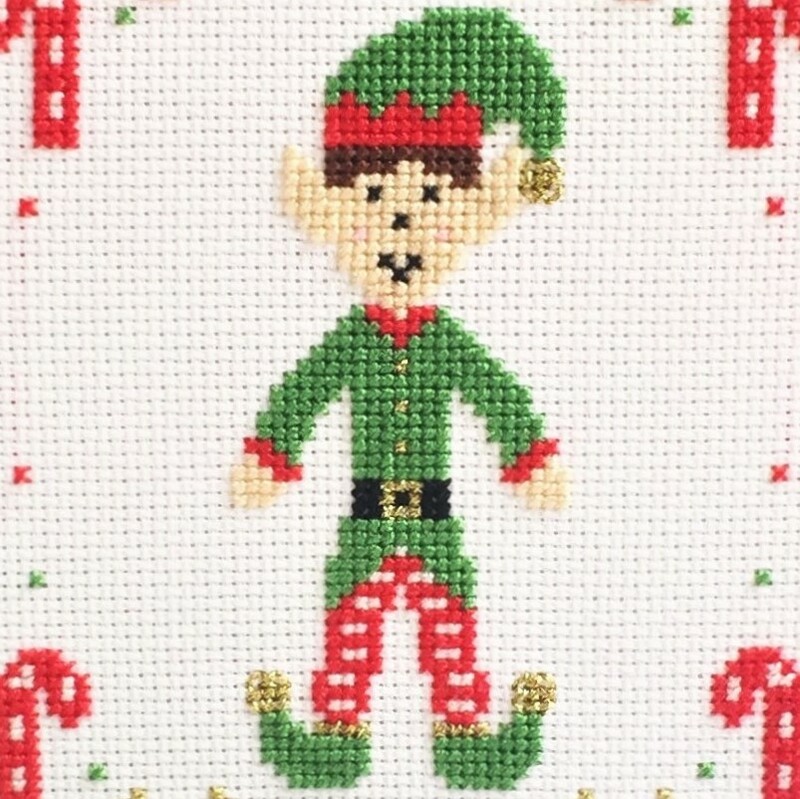 For example, a bell on an Elf’s hat I would stitch in Light Effects, but Étoile works really well for snow. 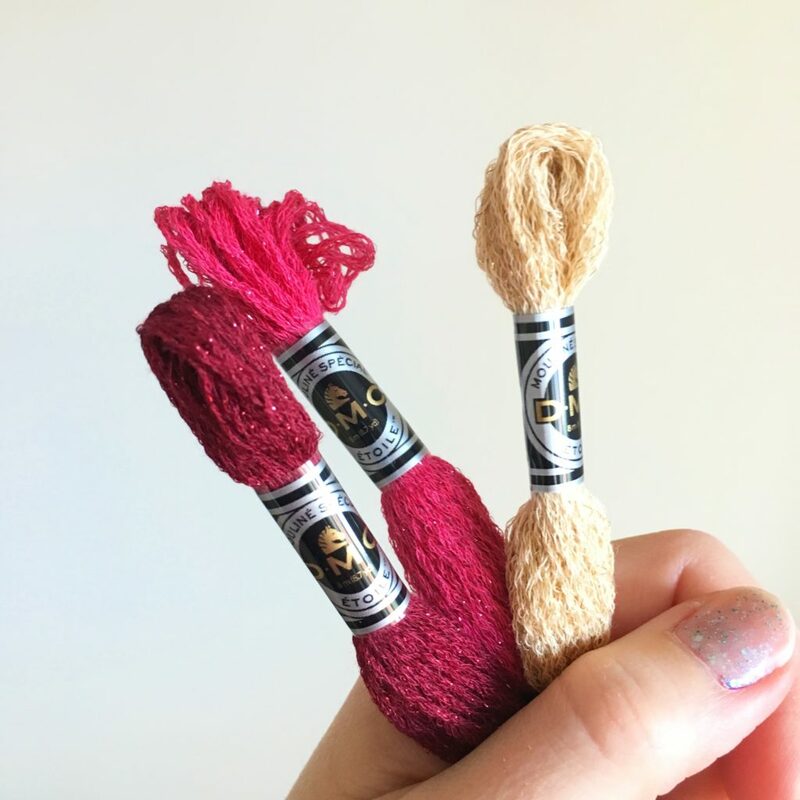 Have you tried these threads yet? 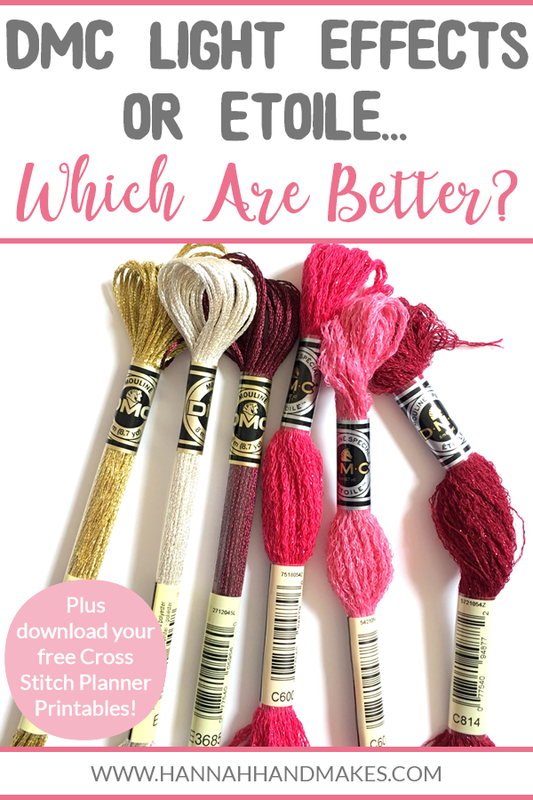 Let me know in the comments which are your favourite (if any) and come and join over 1000 other cross stitchers in my facebook group and share your thoughts.